A set of 10 non-denominated stamps featuring five species of owls in two strips of five se-tenant stamps each will be released on 11th May by Royal Mail. One strip features photographs of owlets while the other one shows adult owls. The popular barn owl is depicted on the first stamp of each strip. It has a white belly, mottled silver-grey and buff, a heart-shaped, white face and black eyes. They make their nests in holes in trees, barns, buildings, and caves. The extensive use of insecticide DDT in the 20th century had made barn owls rare. However, the numbers have slowly picked up now. Little owls are only about 8.5 inches long, weigh around 6 ounces and have a wingspan of 22 inches. It is not a native of Great Britain and was brought there in the 19th century. Today, they are found in large numbers in southern Britain. It is the national bird of Greece and symbolises the Greek goddess of wisdom, Athena. The commonly found tawny owl is featured on the third strip. They are out only at nights and have a very peculiar call. 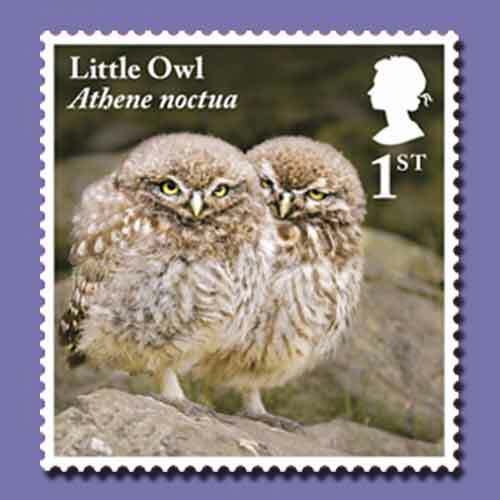 The last two stamps in each strip show the short-eared owl and the long-eared owl respectively. The short-eared owls have yellow eyes and the long-eared owls have orange eyes. The short-eared owl is active during the day as well. Apart from Australia and Antarctica, they are found everywhere else.